The Mission of Far Horizons Archaeological and Cultural Trips? Far Horizons specializes in upscale, educational tours throughout the world, each led by a renowned scholar who reveals the secrets and solves the mysteries of the sites we explore. Our small groups experience a wide range of journeys to countries where the boundaries of archaeological and historical knowledge are being tested and pushed ever outward. We believe that to truly understand an area of the world, it is important not to be just an “observer” of another culture; we must be as much of a participant within that culture as is possible within the confines of the trip. We must explore how the people live today, the challenges they face, their traditions, their goals and their political environment. We limit the size of Far Horizons’ groups to enable participants, wherever possible, to dine in celebrated restaurants and spend overnights in small, bed and breakfast-type accommodations that depict the ambience of the country. Frequently these establishments are housed in charming, restored historic buildings. During a Far Horizons trip, we dine on the local delicacies, drink traditional beverages, learn a bit of the languages, and travel to areas rarely visited by tourists. 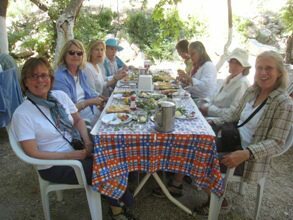 Our study leaders, local guides and tour managers are picked for their expertise in a given area and for their congeniality as traveling companions. This is a vacation after all! The adventure, education, camaraderie of like minded travelers and a new understanding of the world’s cultures, both past and present, have given us an 85% return rate of intellectually curious travelers who return to explore with Far Horizons again and again. Won’t you choose an adventure and travel with the Far Horizons Family?